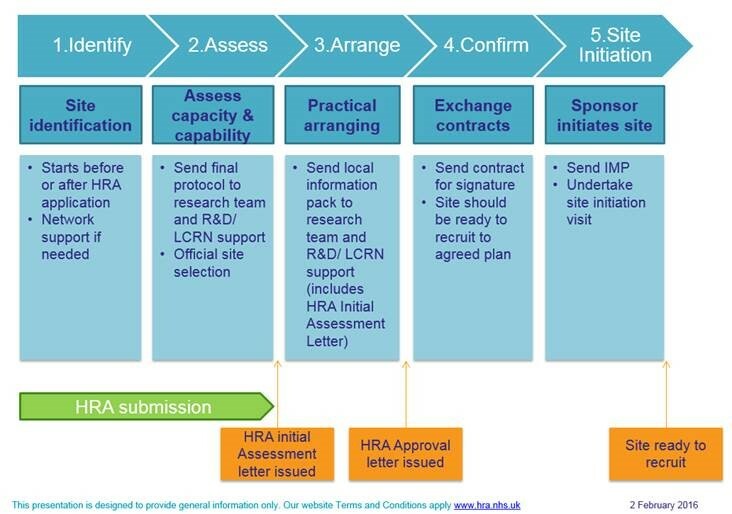 In March 2016 the Health Research Authority (HRA) rolled out a new process for applying for approval for all project based research in the NHS led from England. The new system combines NHS REC approval and what was previously known as NHS R+D permissions. The new application system brings together the assessment for governance and legal compliance undertaken by HRA staff, with the independent REC opnion provided through the UK research ethics service. This replaces the need for local checks of legal compliance and related matters by each particpating organisation in England, allowing the partcipating organisations to focus their resources on assessing, arranging and confirming their capability and capacity to deliver the study. The IRAS e-learning module provides guidance on how to use the system. NB: There are special arrangements for student research studies conducted solely for an educational qualification, that do not require NHS REC review, and are limited to a single NHS site. Please go to student research for further information. Applicants should select 'IRAS form' in question 4- this will generate another question that asks whether the study is exempt from NHS REC review. If the study involves prisoners, NOMS should also be selected, and if the study involves access to identifiable patient data without consent, CAG approval should also be selected. Selecting these options will generate additional questions relating to these types of approval. The NHS REC and HRA will communicate behind the scenes, i.e. there is no need to let the HRA know that the REC have approved the study. 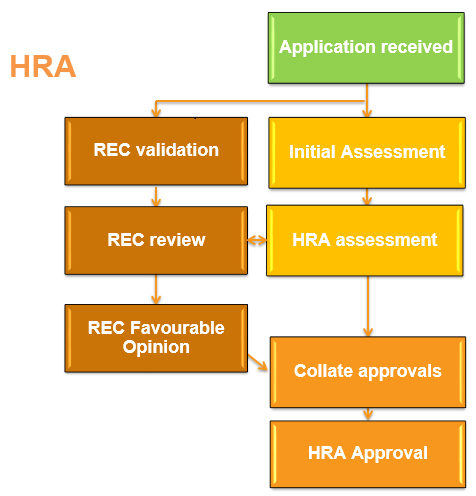 As pictured above, the HRA will collate all approvals that are required for the type of study before HRA approval is issued e.g. MHRA approval, CAG approval, NOMS approval etc. A statement of Activities (SoA) and Schedule of Events (SoE) should be completed for participating NHS organisations in England to be able to assess and confirm their capacity and capability to deliver the research. 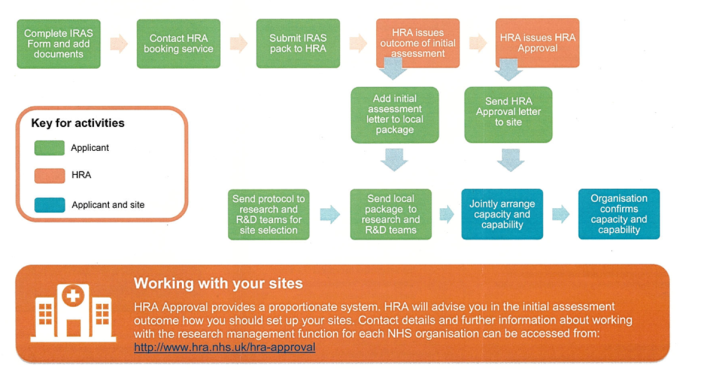 These are required for all projects that require HRA approval where the sites are NHS organisations. These documents should be completed per site type and can be downloaded from the HRA webpages. If all NHS research sites are undertaking the same activities then only one set of documents need to be completed. If different sites are undertaking different activities e.g. some sites are only acting as a participant identification centre (PIC) and others as full research sites, then these are different site types and more than one SoA and SoE will be required. The HRA advises that for non-commercial, non-interventional studies, the Statement of Activities (SoA) should be the only form of agreement between the Sponsor(s) and the site. For projects where the NHS sites are only identifying participants on behalf of the study (participant identification site), the SoA can be used as the agreement. The University, like most other Higher Education Institutions, are not covered by the same insurance and indemnity arrangments as NHS Trusts so for some non-interventional research projects where the site is undertaking research activities on behalf of the University beyond identifying participants e.g. taking informed consent, an additional 'side letter' may also be required. Please contact your R&IS departmental officer or the Research Governance Team for advice on the type of agreement required for the study. For interventional research projects, the model non-commerical agreement (mNCA) will need to be used as the site agreement where the University is sole or co-sponsor. This is required in addition to the SoA and SoE and should be referenced appropriately in the SoA (questions 1, 4 and 5). R&IS will draft this agreement for the project. A template version of the relevant agreement must be uploaded to IRAS prior to submission to the HRA. No signatures are required at this stage and this template site agreement should be uploaded to IRAS with the SoA and SoE as 'other documents' on the IRAS checklist. For research studies including non-NHS sites, such as a private clinic, or an external laboratory, applicants are required to complete a Site Specific Assessment form within IRAS. Please see here for further guidance. The IRAS application form must be electronically signed off by the research sponsor before it can be submitted to the HRA. Please see the Sponsorship Office pages for guidance on the role of the research sponsor and how to apply for the University of Warwick to be Sponsor. All applications for research sponsorship will be reviewed by the University Sponsorship Committee (SC). Applications must be received 4 weeks in advanced of the SC meeting date to be considered. Please ensure time for sponsorship review is factored into submission timelines. The Research Governance Team can advise on applications for research sponsorship sponsorship at warwick dot ac dot uk. Once sponsorship has been approved, the Research Governance Team will issue a letter confirming sponsorship, which should be uploaded to IRAS, along with copies of the University's insurance certificates. The authorised signatory on behalf of the University is Jane Prewett (jane.prewett@warwick.ac.uk), Deputy Director of Research & Impact Services. The sponsor's contact details should be included in section A4 and A64 of the IRAS form. Please see Guidance on how to request authorisation from the Sponsor. Once sponsorship has been approved, all required documents have been uploaded to IRAS and all electronic authorisations are in place, researchers need to phone the Central Booking Service (CBS) to book the application in for review. This is required for all HRA applications, including those that do not require NHS REC review. You must be ready to submit the application by the end of the same day that you book the application in for review. Any changes made to the IRAS form after authorisations are in place (however small- e.g. correcting typos), will invalidate the authorisations and these will need to be requested again. The HRA will not accept applications that have not been authorised by the Chief Investigator, Supervisor (where applicable) and the Sponsor. During the phone call, the CBS will ask a series of questions relating to the project to determine whether it is eligible for proportionate review. Applicants should be ready to answer any queries or requests for additional information from the NHS REC or HRA once the application has been submitted. Where studies require NHS REC review, the REC will issue confirmation that the application is valid and will invite you to attend a meeting where the study will be reviewed. Following the meeting, you will receive a letter informing you whether the application has been awarded a favourable opinion, provisional opinion or unfavourable opinion. Each letter will detail the next steps, and who to contact should you have any queries regarding the decision. In parallel, the HRA will undertake a legal compliance and governance assessment of the study. Once the initial assessment is complete, the HRA will issue an 'Initial Assessment Letter' which will flag issues to be resolved, so these are not duplicated by the sites, and clarifies if any site types do not need to confirm capability and capacity (e.g. some Patient Identification Centres (PICs) or sites where there is limited NHS involvement). A copy of this letter should be sent to each participating site, as part of the local document package. Following the initial assessment, the HRA will issue a letter of HRA approval, once all issues have been resolved and all approvals relevant to the study have been collected. Once received, the HRA approval letter should be sent to each particpating site. At this point, sites should liaise with the Chief Investigator/Sponsor to confim capability and capacity to take on the study. As part of this confirmation, the site agreement or statement of activities that was submitted with the orignal application should be signed off/agreed by each site. Please note, where the statement of activities applies, this is normally agreed by email with the site- no signatures are required. Researchers should not begin collecting any data at site(s) before they have received this confirmation. A copy of the confirmation from each site should be kept with the study documentation in a study master file (see SOP 11: Essential Trial Documentation). Please note agreements should be signed off by a senior member of Research & Impact Services- and not signed by Chief Investigators or Heads of Departments. Please contact your R&IS departmental officer to arrange signatures. Studies should not begin until all the relevant approvals are in place and all contracts have been agreed and signed. Any researchers that begin research activities before appropriate approvals are in place could be subject to research misconduct. If in doubt, please check with the Research Governance Team in R&IS. If your study is eligible for adoption by the UKCLRN portfolio your Comprehensive Local Research Network (CLRN) may be able to assist you with gaining HRA approvals. For further guidance please view the National Institute for Health Research (NIHR). The Clinical Research Network West Midlands provide an early contact point for researchers for advice and support in the set up and delivery of research studies in the NHS. Whether the study is at the research idea stage, grant application stage, or beyond, please contact study dot support dot crnwestmidlands at nihr dot ac dot uk as soon as possible to discuss how the CRN can support your study. The study support service is formed of a number of early contact leads (who are also AcoRD specialists) providing support for both primary and secondary care studies. The CRN can also offer support for primary care studies. Please see the Principles of set up for a study in Primary Care , for further information. 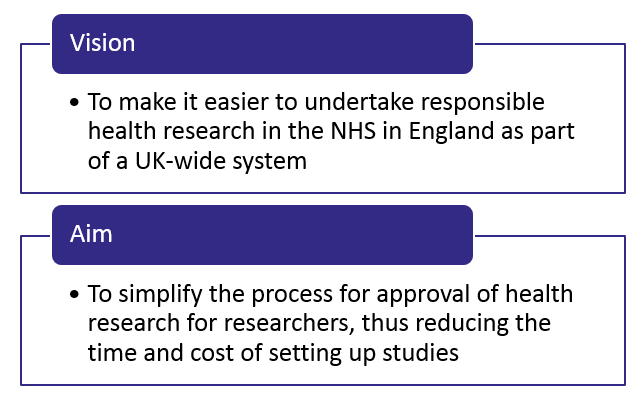 University researchers wishing to conduct studies within the NHS need to obtain NHS permission from each Trust that is involved in the study and researcher may also require a research passport and/ or honorary contract. For further information on the process for obtaining NHS R&D Trust Permissions or Approvals contact the R&D Department of the main Trust(s) involved in your study for guidance. Please see our web pages for further information about Research passports and Honorary contracts. are not applying for support from the NIHR Clinical Research Network (CRN). It is expected that the University will act as the research sponsor for these studies. The role of the Chief Investigator (CI) should be undertaken by the relevant supervisor or course leader, not the student. The roles and responsibilities of the student are outlined in section 9.3 of the UK Policy framework for Health and Social Care Research UK Policy Framework for Health and Social Care . The University has an exisiting partnership with the University Hospitals Coventry & Warwickshire (UHCW) where this arrangement applies. Students will be required to complete a GafREC questionnaire which can be requested from the team at: R&D@uhcw.nhs.uk. Copies of all study documentation will need to be sent to UHCW, with a copy of the BSREC ethics approval letter and the completed GafREC form for review. For sites other than UHCW, please contact the R&D department of the NHS trust in which you wish to undertake your research for guidance on whether HRA Approval is required, or if local arrangements are in place. Local arrangements are likely to vary across different NHS Trusts. At some sites an IRAS form may be required, but this will not need to be submitted to the HRA. For further support and to discuss arrangements for the study, please contact the Research Governance team: Sponsorship at warwick dot ac dot uk or m dot gane at Warwick dot ac dot uk. The training is free of charge, but applicants need to create a HRA training account in order to receive a certificate of completion. Please see the Warwick Standard Operating Procedures (SOPs) for further guidance. These are intended to be a guide for best practice on all aspects of running a study in the NHS. Please note that these SOPs apply to all Warwick sponsored studies and are not limited to clinical trials. Futher resources and training materials relating to HRA approval can be downloaded from the HRA webpages.